Over the last year or so, I’ve become increasing more interested in something called Heart Rate Variability. Most people are familiar with heart rate. How many times per minute your heart beats. When we think that our heart is beating at 60 beats per minute (bpm) it’s not actually beating uniformly. I.e. 1, 1, 1, 1, – the gap between beats isn’t exactly even. There is a variation or variability. i.e. 1.02, 0.89, 1.1, 0.95, 1.07… This is called the heart rate variability – the beat to beat changes in your heart beat. Having a high variability is a good sign (as opposed to a high heart rate, at rest. The lower your heart rate, the fitter you are – generally. 60 – 70 bpm would be average. A fit recreational person might have a resting heart rate of 50 – 60 bpm, and an athlete 40 – 50 bpm. Even lower first thing in the morning). With heart rate variability (HRV) we do want a high number, although everyone’s baseline will be different. A high number means that you have a heart that can cope with sudden changes. It’s like being able to go from standing to sprinting to standing again really effortlessly. A bit like doing HIIT (High Intensity Interval Training). And not only that, but if you train your HRV to have nice even variations it does wanders for stress and anxiety. There are two apps that I regularly use to measure HRV. A typical reading on the Elite HRV app. This free app pairs with a bluetooth chest strap and I use it first thing in the morning before I get out of bed. You need to measure your morning readiness before you do anything in the day. After a short reading (minimum 1 minute, but I go for 2.5 mins) it will measure your HRV and tell you whether you are in sympathetic or parasympathetic nervous system mode. Sympathetic is also known as fight or flight (stressed) mode. This could be because you’ve overtrained, not slept well, or generally stressed or about to come down with some illness. Parasympathetic is known as rest & digest and recovery mode. This might be that you are recovering from a strong workout the day before, you are very relaxed, or you are healing. 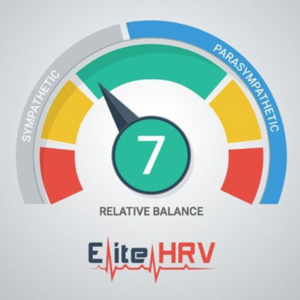 The Elite HRV app has a scale of 1 – 10 for parasympathetic and 1 – 10 for sympathetic. Ideally you oscillate either side of 10 by a point or two. Train hard, then recover and so on. It’s useful to know as when you are, for example, a 5 or 6 out of 10 on the sympathetic side and don’t realise it, and decide to train hard, you’re more likely to injure yourself or get ill. The other week, I woke up feeling bad (a rare occasion) as I had been sick overnight. I thought it might have been food poisoning (I later surmised it must have been a virus as both my sisters had the same symptoms of sickness and massive fatigue that lasted almost exactly 24 hrs, like me). When I did my HRV reading I was a ‘3’ in the sympathetic side! I already knew I was going to take it easy, but for most people, if they are not as low as a ‘3’, they might train hard and be more susceptible to getting a cold or something. Heartmath is a way to de-stress and bring balance back into your life quickly. It uses HRV to help get your HRV into a more coherent state. Creating nice even spaces between peaks and troughs in your HRV. This helps bring your system to a nice stable place. When we are stressed or frustrated our HRV is all over the place. When we are calm and relaxed, there is a nice symmetrical wave. I use the Inner Balance app from the Heartmath Institute. The app is free but it does require their (has to be theirs) bluetooth or connection sensor. Which is pricey. Still, worth the investment if you want to train your heart to be in a coherent healthy state. HRV is a really useful way to see the state of your nervous system and health. 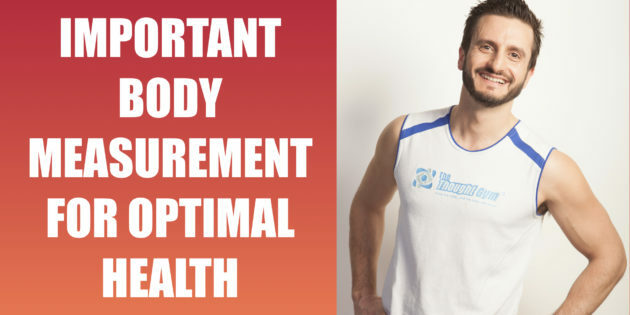 On a day to day basis it’s the only measurement you really need to see how you are doing. That’s why I recommend both apps and delving into HRV further yourselves to see what knowing your HRV can do for you. 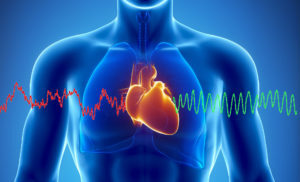 Do you know about HRV? Or have you played around with it in the past? Let me know below.